Chris - So what actually is this virus? 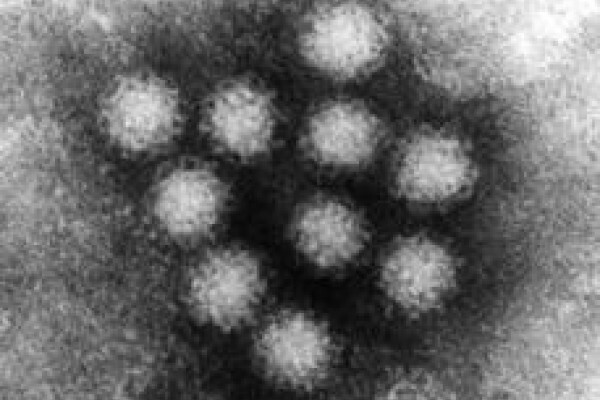 Jim - Right, norovirus has previously been called the small round structured virus (SRSV) or the Norwalk-like virus. It's an RNA virus and is actually a very stable virus. It requires a low infectious dose to cause gastroenteritis, there's a short incubation period associated with this disease and there are multiple transmission routes; so you could have transmission from person to person, through food, through water or from environmental surfaces. Chris - So how long after you catch it do you start to feel unwell? Jim - About 24 hours. Chris - Oh, so it's very quick! Chris - So how does it actually spread then? Jim - It's spread usually by contact with someone who's infected, or someone contaminating food or water or contaminating surfaces, anything that they touch with their hands. Chris - And so once you take the virus into your body, talk us through what actually happens next? Jim - The virus obviously gets into the gut and begins to replicate. The interesting thing about norovirus is the site that it replicates at is the site where you have the disease, and therefore there is no lag time - there's no time for the immune system to react before the virus starts to replicate. And so everyone will be constantly infected throughout life. Chris - And so every single body product, both vomit and diarrhoea, is highly infectious? Jim - In a gram of faeces or a gram of vomit there are probably about a million infectious doses. So you could infect a million people with a gram. Chris - Wow, that's a lot, isn't it? "We've had a bit of an epidemic here around Boston these last two months, and I've been getting into some trouble with my feminist friends for saying this, but of all those I know who've gotten it, the women have been hit far worse than the guys. For instance, I had a very upset stomach for a couple of days, and our 2-year old son vomited once but otherwise seemed almost fine, but my wife was violently ill for a day, had it coming out both ends if you know what I mean. I know two other couples with similar experiences." Jim - Well, women probably have more infections because they have more contact with children. They change the nappies whereas the fathers rarely change the nappies. Its contact with the virus, really, that's causing the disease. Why children have milder disease than adults is because these viruses are circulating all the time in children. They're having multiple infections and therefore have some level of immunity to the virus, whereas the adults haven't seen this virus since they were a child, and therefore they have very low, or no, immunity to the virus. Chris - So why are we seeing big outbreaks of this? There are lots of causes of food poisoning, why is this one doing the rounds at the moment? Jim - Because it's an RNA virus, it has the ability to mutate quite readily and therefore be selected, and so what you see here are variants of the virus circulating. As the population develops immunity to those viruses, a new virus is selected. So we se waves of epidemics probably every two or three years across the world as a new virus is selected. It's very much like influenza, we see exactly the same thing with influenza, every two or three years a new variant is selected. And so all these RNA viruses are susceptible to mutation. Chris - How do we avoid getting it, Jim? Jim - Good hygiene! Wash your hands I think is probably the best approach, I think. There is no real prospect for a vaccine for this virus because of the rate of mutation - you would need to have a vaccine for every year. And so the best approach is good hygiene, as the virus is usually passed on by touching, so wash your hands. If someone in the house is ill, then make sure that you wash down surfaces, that you use a weak solution of bleach, to wash down surfaces, that'll kill the virus. Chris - I work in a hospital as a virologist, and I was shocked when someone pointed out to me all these wonderful alcohol hand rubs that we should be using on all the wards, and they actually said to me 'that doesn't affect norovirus at all'. Jim - That's right. Alcohol will usually attack a surface that contains a lipid. Norovirus is protein, there's no lipid in norovirus so all you're doing is moving the virus around a surface using alcohol. Chris - So soap and water is the order of the day.